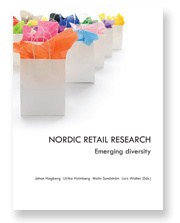 Nordic Retail Research: Emerging Diversity is a new anthology of research on retail and wholesale research. The book deals with various aspects of retailing and provides valuable reading for those interested in the future of retail. The editors are from the Center for Retailing at the Gothenburg School of Economics, Business and Law. The book includes a presentation of studies regarding consumer behavior, service, availability, profitability, innovation, logistics, safety, technology, durability, mobility and internationalization. 40 authors from different institutions are involved in the book, which is based on contributions to the 2nd Nordic Retail and Wholesale Conference held in Gothenburg, November 2010. – Retail and wholesale are facing major challenges, and the trade is forced to consider if the usual way of doing things are enough if you want to find innovative solutions to increase customer value. This anthology is different in that it presents a wide range of studies in which researchers from different disciplines with different views on the phenomenon give their perspective. For those thinking about the future of retail and wholesale and seeking new ideas and concepts the book is valuable reading, says one of the editors Malin Sundström. The new book addresses researchers, students at advanced level and people who are active in retail and wish to know more about retailing research in the Nordic countries. The book’s editors Johan Hagberg, Ulrika Holmberg, Malin Sundström, and Lars Walter are all active at the Center for Retailing at the School of Economics, Business and Law at the University of Gothenburg. – Research on retail and wholesale is flourishing. This anthology contributes to a growing body of books that are a result of this research. The book excels in that scientists from many different disciplines and institutions work together, says Johan Hagberg. The book can be ordered in bookstores from example Bokus or Bokia or from the publisher at BAS@handels.gu.se. Nordic Retail Research: Emerging Diversity. Johan Hagberg, Ulrika Holmberg, Malin Sundström, Lars Walter (eds). Bokförlaget BAS. Centre for Retailing (CFR) is a research center at the Gothenburg School of Economics. CFR’s purpose is to promote and support research, education and business contacts in trade, increase awareness of the importance of trade and create greater interest in trade as a phenomenon in society. CFR’s core activities funded by the Handelns Forskningsstiftelse in Gothenburg, which also funded the printing of the book.